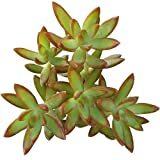 Sedum adolphii growing succulent herbaceous of the genus Sedum also known as Sedum adolphi or Golden sedum, Sedum adolphii perennial evergreen plant, used as ornamental ground cover plant and drought tolerant, can grow in mediterranean, desert or subtropical climate and growing in hardiness zone 10+. 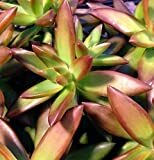 Leaves color green, yellow, red, orange or mix in cone shape. Flower color white in star shape the flowers grow in clusters in ball shape. 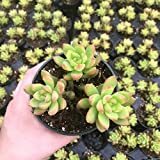 Sedum adolphii, native to Mexico, forms rambling stems with waxy golden yellow leaves with pinkish-peach margins in bright light.